Since I started this blog I wrote a few posts about computer science and programming in particular, but I recently realized that I hardly ever discuss which tools I recommend. The reason why I thought it was a waste of time is because most of the time, blogger will talk about a given tool because the editor contacted them and gave them a free license against a review. With proper disclosure of the arrangement and an objective point of view of the product, I don’t see any problem with that, but I though there was already enough material available online to discuss well-known tools. However, I think some of them remain unknown and in some instances quite unfairly so. The tool I want to talk quickly about in this post is a perfect example: it’s call LINQPad. First, I want to say that I did not have any contact with the editor, and that I bought my license (which enables more options, I’ll come back to this, but the main features are free). Hence, this “review” is totally objective. 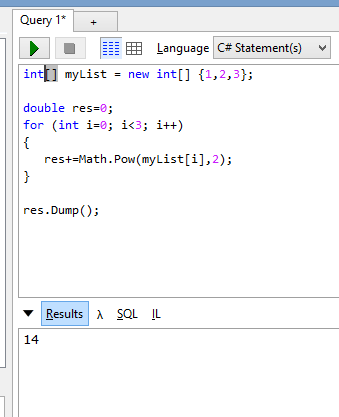 Basically, LINQPad allows you to write a snippet of code in C# or F# and to display some output without having to create and compile a Visual Studio project. This is really incredibly useful. This example is fairly basic, but the cool thing is that you can access almost anything in the .Net framework and, if you need to, even reference some of your own DLLs or a even a Nuget package. Another power feature of LINQPad is its ability to allow you to “import” data source and interact with them easily. As a matter of fact, it comes with several built-in or third party providers which will help you through a simple wizard to configure the access to a given data source which you will then be able to query using LINQ. These data sources can be various: SQL, MySQL, RavenDB, Web Services and so on. Once the wizard is complete, you can access just as you would browse any type of collection which supports LINQ. Again, you can write some scripts to retrieve some records, process them and display what you need. This is extremely useful if you have a database with a lot of data and you want to try different ways of displaying the information for example. It’s also very useful if you built some software but you didn’t have the time to write the administration part, you will still be able to extract the data and use it before you get the chance to create beautiful grid and everything -or before you actually give up because LINQPad might be enough if you don’t need to be over user-friendly. That’s it, have a look at it, and buy it if you want to have some nice features like the intellisense and helpers of the sort. It really helps me a lot and avoids me creating a lot of useless visual studio projects. CFA Level III, here I come! I know it’s been a long time since I last posted on the site and I would like to apologize for not having been adding new content since the end of May. Quite frankly the reason why I’ve been away from the blog from a long time is twofold. First, I am planning my wedding for the end of the year and it is taking me most of my spare time – for those of you who are married, you know what I mean. Second, I had a very bad feeling when I came out of the Level II exam and I was actually quite disappointed. So, I decided to take a break and to focus on the wedding before heading to my summer holidays and to wait for the results. In the end, once it’s done, there is nothing you can do about it. Tuesday, late in the afternoon, I finally got the crucial CFA e-mail, which noticed me that I had passed the Level II along with 43% of that level’s candidates. I literally jumped out of my chair as if I had scored a goal in the champions league final. Let’s face it, I most certainly had a bit of luck here. Looking at my “detailed” results (which, as you well know, I’m not allowed to share), I then realized that my work had paid off. Although I did not post about the accounting part because I feel I am not expert enough to really publish something about it, I really paid a lot of attention to this section of the curriculum. And it paid off. As a matter of fact, there is so much weight on this topic in the exam that you can definitely get yourself in a nice position by being confident on the classic exercises. I did practice a lot using Schweser’s QBank and practice exam. In the real exam, I felt accounting questions were not that vicious and hence I managed to score high there. So, for those of you who are taking the Level II next June, spend a lot of time on accounting if you’re not very good at it. The material is quite huge, but as your practice it will start making sens and quite surprisingly there is not much to learn by heart in a way: it is more logic that it might seem at first glance. Free cash flows are also a major topic of the Level II. Again, when you look at the formulas you might get scared at first glance. However, you should realize that by learning the main formula, you can derive all the other without learning them by heart. Again, even this basic formula might seem quite complicated at the beginning, but it really make sens once you get used to it and I found it quite easy to apply once you understand the rationale behind it. Economics and Alternative Investments were the most complicated parts of the curriculum to master in my opinion. In fact, I believe that both these topics require a lot of material to be learnt by heart if you’re not practicing them in your daily job. And I hate learning stuff by heart. Derivatives are of the same kind, but with my quantitative finance academic background, I already knew all the material. Again, if you’re not familiar to derivatives, you will have to grasp a lot of concepts which take time to get accustomed to. All in all, I would say that the basic strategy is really not to give up on any topic of the curriculum. Of course, there will be part of the material you will not be comfortable with on exam day, but you definitely should have an idea of what’s going on everywhere. If you can’t master something, at least grasp the global picture. This is key because it will most of the time allow you to discard one of the three possible answers. Once this is done, even if you choose randomly between the remaining two answers, your probably of success drastically goes up to 50% instead of the initial 33%. Plus, don’t forget that item sets are composed of questions of various difficulties. Hence, being able to score on the easy questions is critical as it can considerably improve your overall result. Remember that if you get battered in a particular topic, it probably won’t matter what you’ve done in the rest, you will fail the exam; the passing criteria are not public and I suspect there is a minimum score for each of the topics. To sum up, I’m really happy to be done with this Level II because I heard it was the most difficult of the three for candidates with my profile. I must say that I won’t be disappointed of not having Economics and Financial Accounting in the Level III material, but I will have to work extra hard on my writing skills as the Level III’s morning session consists in writing small essays… not in question sets. I’ll be back soon with more posts on something else than the CFA! A few days away from the exam, I am taking a bit of time to post the main picture of some topics on the curriculum, which I think can be simply explained. This post is dedicated to forwards. Keep the stock at the value $S_T$. The results for the law of one price, and we call that an arbitrage argument because if the price was any different from stated above, the you could make instant risk-free profit by doing the strategy previously stated (or its opposite). For example, assume a stock is worth $S_0=100\$$ today, that the interest rate $R=10\%$, and that you want to buy the stock forward in 1 year. Then, $FP=100 \cdot.(1+10\%)=110$. If somebody is willing to buy it forward for 115, then enter the forward contract as a seller, thus agreeing selling $S$ for 115 in a year. Borrow 100 today, buy the stock, hold the stock, repay your loan plus interest in a year for 110 and give the stock to the counterparty for the agreed 115. You get a free lunch of 115-110=5. If somebody wants to sell the stock forward for 105, you should agree to enter the contract as a buyer. Sell the stock short for 100 today, invest the proceeds for the interest rate today, collect the interest invested of 110 in a year, and buy back the stock as agreed for 105. You make a free lunch of 110-105=5. Notice that this is the value for the long side, i.e. for the person agreeing on buying the asset at expiration for the forward price. Because derivatives are zero-sum games, the value of the short side is the opposite of the value of the long side. That’s it. I’ll come back with variants later.